We're pleased to announce that we have invested in adding PDF print capabilities to plotaroute.com, so you can now print route maps and directions directly to PDF files. Printing from web browsers often creates different results depending on the browser you are using, but PDF printing is carried out on our server, so enables us to provide a consistent output regardless of your choice of browser. The print settings themselves are unchanged, so you still have lots of control over what you want printed and how you want it to look, including a choice of map types and the option of including elevation profiles and directions. If you have a Premium account you can also print your route maps over multiple pages to show more detail, including a separate elevation profile for each section of the route. 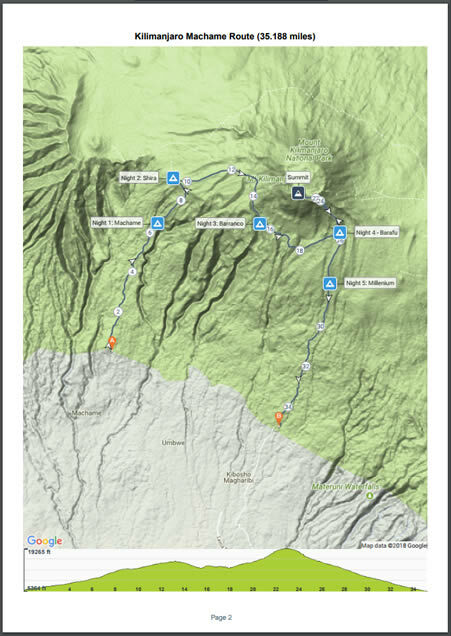 To see an example of how you can create great looking printouts of your routes using plotaroute.com, have a look at this PDF printout of a climb up Mount Kilimanjaro.